2008-2012 Mercedes-Benz GL550 4MATIC 4-Wheel Air Suspension Conversion Kit (MK14G) is the perfect solution to your air suspension problems. Designed to be very affordable, you can convert your air suspension to use standard. Strutmasters' air to non-air suspension conversion kit gets rid of the vehicle's expensive dependence on faulty electrical components for good. The kit, manufactured in America, includes two new Eibach coil springs with mounts and two passive hydraulic fluid. Customers appreciate the detailed instructions that come with each kit. The kit is installed in as little as one hour per wheel. The parts are excellent quality and guaranteed by our Lifetime Limited Warranty. Compared to dealership direct replacement and individual aftermarket part replacement, this conversion kit is considerably more affordable. Our ASE certified technicians are happy to provide excellent customer service throughout the purchase and repair process, too. Read the positive customer reviews to see firsthand why the majority of GL550 4Matic owners switch from air to non-air suspension using our kit. Early detection of a failed or leaking air suspension is the key to avoiding total failure. Look for these common signs that indicate the air suspension is going bad in the 2009 GL550 4Matic, before it's too late. The most noticeable sign is a sudden uneven height difference between different sides of the GL550. A sagging rear end, with an inflated front end, is typically seen. This gives the illusion that the GL550 is squatting down in the rear. Some drivers notice a shifting lean from one side to the other. If not fixed promptly, these height differences can wear out the air compressor. If the air compressor has already stopped working, a suspension warning light will turn on. At this point, suspension failure is advanced and an expensive direct replacement may be necessary. = TOTAL: Over $3,900 (and that doesn√¢¬Ä¬ôt even include replacing electronic components that are known to fail such as the height sensors). = TOTAL: Over $3,300 (and that doesn‚Äôt even include replacing electronic components that are known to fail such as the height sensors). 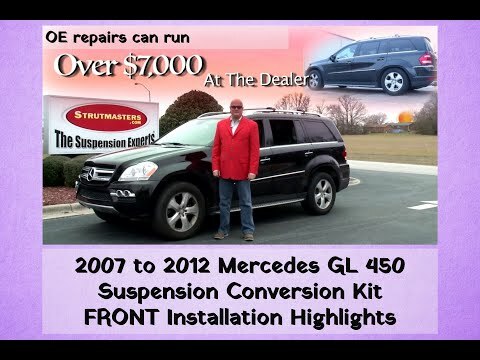 Choosing the rear air-suspension conversion kit for the 2009 Mercedes-Benz GL550 4MATIC saves YOU over $1,500!